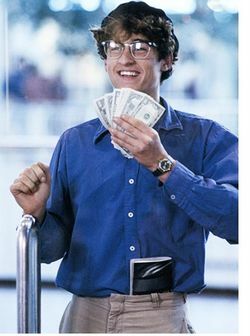 In 1987, Patrick Dempsey starred in a movie that gave geeks everywhere hope that they might have a shot at being popular. The movie was called Can't Buy Me Love, and the somewhat far fetched storyline was that a geek paid a popular girl at his high school $1000 to pretend to be his girlfriend. Over the course of the movie, he does become popular, then gets outed for the fake relationship and loses his status. The film ends with the girl realizing she actually does love him for his "inner beauty" and they ride off into the sunset on a lawn mower. The irony of the title is that money does indeed accidentally buy him love. When it comes to social media, this idea that you can't buy affinity also seems to be a basic truth. Most self respecting social media users and any consultant with half a shred of credibility would strongly counsel any client they had against trying to buy followers on a site like Twitter. Imagine for a moment that this same Twitter account were an empty restaurant that you were walking past. No one wants to eat in an empty restaurant – there is usually something wrong with the food. If that same restaurant were full, mahy diners would reconsider dining there. Following this logic, it could be more likely that someone would follow your Twitter account if they see some critical mass of followers, rather than very few. On Twitter, you can buy those first followers. Are they likely to be completely useless and not engaged in what you have to say? Yes. Is this the ideal way to grow a Twitter account? Of course not. Will it break some unwritten (or perhaps written) rules of social media and have social media gurus raising their 140 character swords ready to fight? Probably. But the sad fact of Twitter is the most of anyone's followers (whether grown authentically or not) are simply not engaged on a frequent basis. Perhaps having a large initial pool of unengaged followers is not so bad, especially if those initial followers can help you to attract the right kind of followers who actually will be engaged. This month's Entrepreneur Magazine featured a column from Jonathan Blum titled "Rented Friends" where he tried an experiment in buying 5000 followers for $430 on Twitter to see what would happen. As he noted for a conclusion, "5000-plus followers does count for something in the nutty social media world. The bottom line: Yes, some of these followers may not be real. … social media is so bizarre that whether or not my followers are real is almost beside the point." I will probably never buy my Twitter followers, and am not quite ready to start suggesting to clients that this is a good strategy. Still, part of evolving with social media is being open to even the most heretic of ideas. The ultimate principles of creating great shareable content and engaging authentically in social media still matter. My only point is this: You still can't make someone fall in love with you or your brand … but maybe a little cash can help stack the deck in your favor.